It’s a jungle out there… Manu and Sacha are two young coatis living in the Mexican rainforest. They are deeply in love with each other! The only problem is that Sacha is the daughter of the coati tribe’s king and Manu is a bit of a troublemaker. When Manu’s escapades leave the tribe’s most worshipped statue destroyed, the King exiles Manu to live on his own in the jungle. A year later the fumbling youngster has turned into a strapping young male but one thing hasn’t changed: Manu is still in love with Sacha. 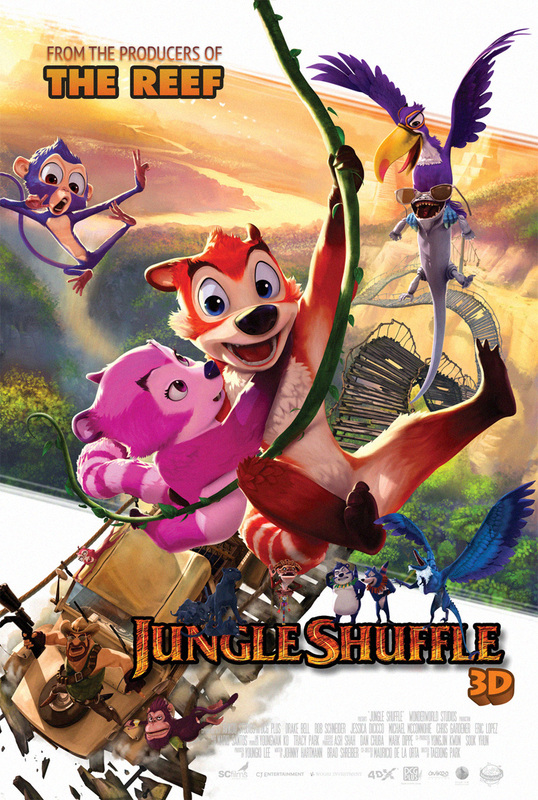 When Sacha gets captured by human poachers, Manu sets out on a thrilling adventure to save the coati princess and redeem himself with the tribe. On his journey he teams up with Chuy, a lively and courageous spider monkey, and the chaotic duo face the many dangers of the tropical rainforest. Except to free Sacha out of the clutches of the mysterious Dr. Loco, Manu has to accept that even the bravest hero needs a helping hand… paw, claw or talon. In the end the animals succeed in freeing their friends and learn an inspiring lesson about friendship and their – and our – relationship to nature.